Would you like to have access to not only rich real-time process data and actionable insights from the HMI/SCADA layer, but capabilities to visualize, analyze the information on the go? 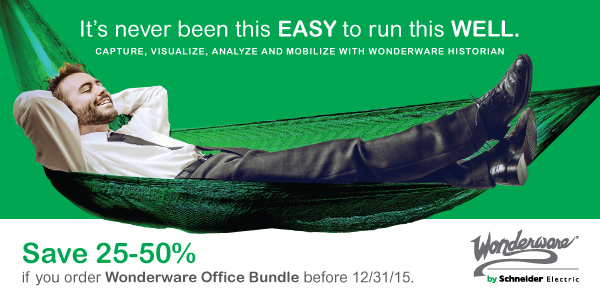 Schneider Electric, the global specialist in energy management, has released a new offer, Wonderware Office. The new bundle is the foundation to Capture, Visualize, Analyze your process & operations data. The Schneider Electric Software Mobile solutions allows you to “take it with you” to monitor your operations, 24 x 7. You can also add “Alerts” that you set to be made aware of key production or process information. 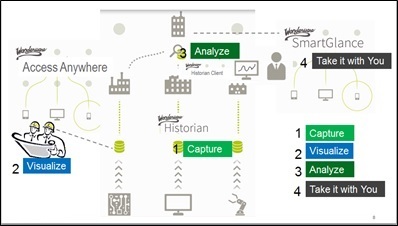 Wonderware Office is the answer to full fidelity Industrial Information Management, offering a variety of clients to meet the needs of both operators and management within an enterprise and the capabilities to take the industrial information management to the next level. A bundle built especially for you! It is not just about extending the value, but Wonderware Office bundle supplements the investments you have already made. Leverage the investments and content you have in your automation layer by extending the information to a wider set of users. This exclusive bundle is valid till the 31st of December, 2015. Contact your local distributor to take advantages for this bundle and be a part of the enterprise transformation.